It is no longer controversial that the American political system has become deeply dysfunctional. Today, only slightly more than a quarter of Americans believe the country is heading in the right direction, while sixty-three percent believe we are on a downward slope. The top twenty words used to describe the past year include "chaotic," "turbulent," and "disastrous." Donald Trump's improbable rise to power and his 2016 Electoral College victory placed America's political dysfunction in an especially troubling light, but given the extreme polarization of contemporary politics, the outlook would have been grim even if Hillary Clinton had won. The greatest upset in American presidential history is only a symptom of deeper problems of political culture and constitutional design. 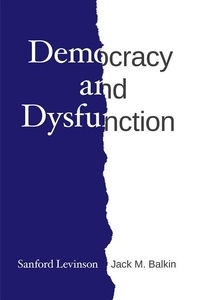 Democracy and Dysfunction brings together two of the leading constitutional law scholars of our time, Sanford Levinson and Jack M. Balkin, in an urgently needed conversation that seeks to uncover the underlying causes of our current crisis and their meaning for American democracy. In a series of letters exchanged over a period of two years, Levinson and Balkin travel--along with the rest of the country--through the convulsions of the 2016 election and Trump's first year in office. They disagree about the scope of the crisis and the remedy required. Levinson believes that our Constitution is fundamentally defective and argues for a new constitutional convention, while Balkin, who believes we are suffering from constitutional rot, argues that there are less radical solutions. As it becomes dangerously clear that Americans--and the world--will be living with the consequences of this pivotal period for many years to come, it is imperative that we understand how we got here--and how we might forestall the next demagogue who will seek to beguile the American public.